Scott Dunn has tipped the Indian Ocean island as the perfect destination for families and couples to visit in 2019, with its easy flight access, low Zika risk, minimal time difference, and long dry season. In February 2019, a new Scott Dunn Explorers kids club will launch at Shanti Maurice – its first kids club to open in Mauritius. The destination offers luxury travellers value for money during this period of frequent currency fluctuations. Scott Dunn has identified a range of exciting new accommodation and immersive ‘Fly and Try’ tours from culinary experiences to adventures such as parasailing and underwater walking. Mauritius has long been a favourite destination for luxury travellers, and this year Scott Dunn has highlighted a range of compelling reasons for why Mauritius is hot for 2019. Neighbouring Indian Ocean destinations such as the Maldives, Madagascar and the Seychelles have been attracting traveller’s attention with new hotels and flight routes, but Mauritius should be the island escape on everyone’s radar this year. With its easy overnight long-haul flight access, minimal time difference and extended dry season this Indian Ocean gem now sees a range of recent hotel openings and exciting new experiences that highlight the unique culture, cuisine and incredible landscapes, offering guests more than just a restorative beach break. As Scott Dunn contracts with Mauritian suppliers in GBP the island has been identified as a destination offering value for money in 2019. Travellers can take advantage of holiday prices not affected by currency fluctuations. Families and couples can also make the most of the easy flight connections to South Africa, combining the island with a malaria-free safari break for a bucket list worthy adventure. For guests seeking a unique experience, Scott Dunn can arrange a stay at the new Bubble Lodges, located on Isle Au Cerf on the lesser known east coast of the island. Tapping into the growing trends of astro-tourism and more unusual places to stay, the luxury transparent lodges, which opened in May 2018, allow guests to sleep under the stars. Travellers seeking more active experiences can explore the island’s natural beauty, by kayaking, stand-up-paddle-boarding or hiking the highest mountain in Mauritius, Le Piton de la Petite Riviere Noire with an expert private guide. For the more adventurous, guests can enjoy a parasailing adventure off the Mauritian coastline to witness a breath-taking bird’s eye view of the turquoise lagoons and towering peaks. For a more unusual experience, guests can enjoy the thrill of underwater sea walking. Available from age eight, guests can get up-close to marine life by walking along the sea bed immersed in glass dome helmets and accompanied by a private guide. Older children will be taken on island excursions including a visit to La Vanille Nature Park where they will meet Mauritius’s most famous resident – Domino, the centenarian giant tortoise. Children can head to the driving range at Avalon Golf Estate where they will be introduced to the game and have a lesson with a golf pro. At La Kaze Mama children will learn to cook like a local using ingredients grown in the hotel’s vegetable and herb gardens. Shanti Maurice’s resident ‘Grandma’ will show children how to cook delicious local sweet treats and feratha bread. More adventurous children can head out to sea for a day of fishing using traditional Mauritian techniques. Other water-based activities include stand up paddle- boarding, kayaking and snorkelling. The Explorers programme even offers pampering sessions for children at the hotel’s spa. 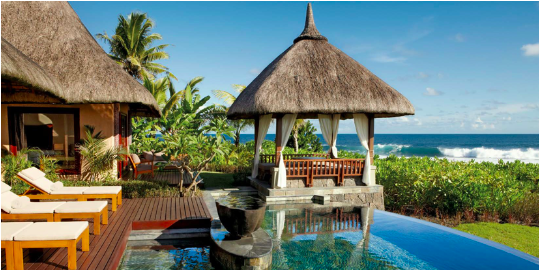 HOW: Scott Dunn offers 10-nights at Shanti Maurice from £8,960 for a family of four. The price is based on sharing two interconnecting junior suites on a half-board basis and includes two spaces at the Explorers kids club, British Airways flights from the UK and private transfers.